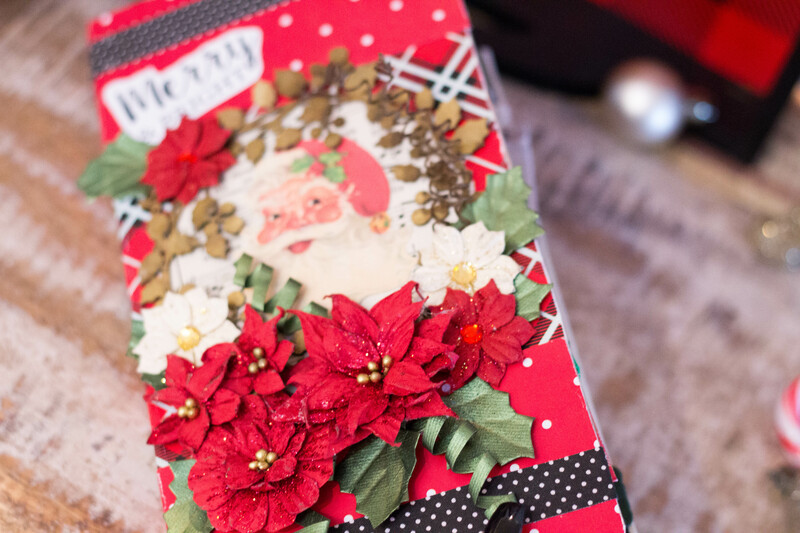 The holidays are coming, and as the Christmas spirit starts welling up in me, I get inspired to create pretty things like this Christmas Journal! 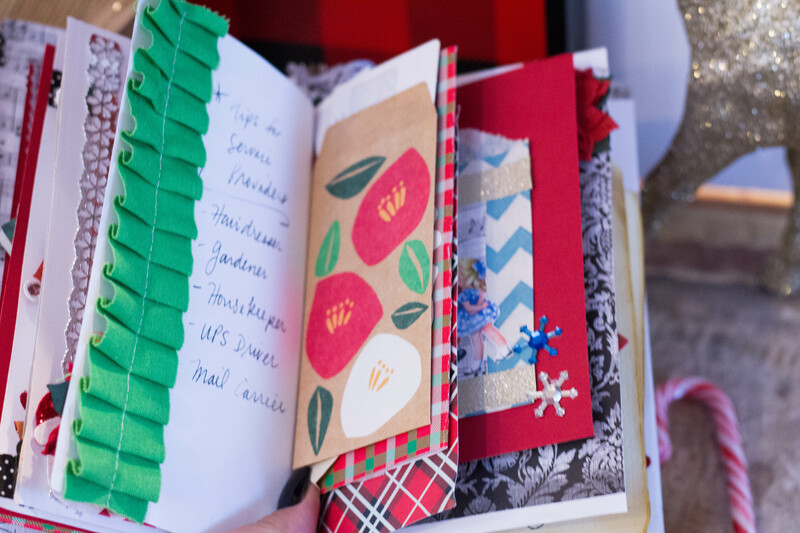 This wonderful little red and black Christmas Journal is filled with pages to help keep me organized with all things Christmas, including shopping lists, recipes, reminders and even some handy pockets for cash and gift cards. Most of all, it’s as pretty as it is practical, which is a must for me when making journals. 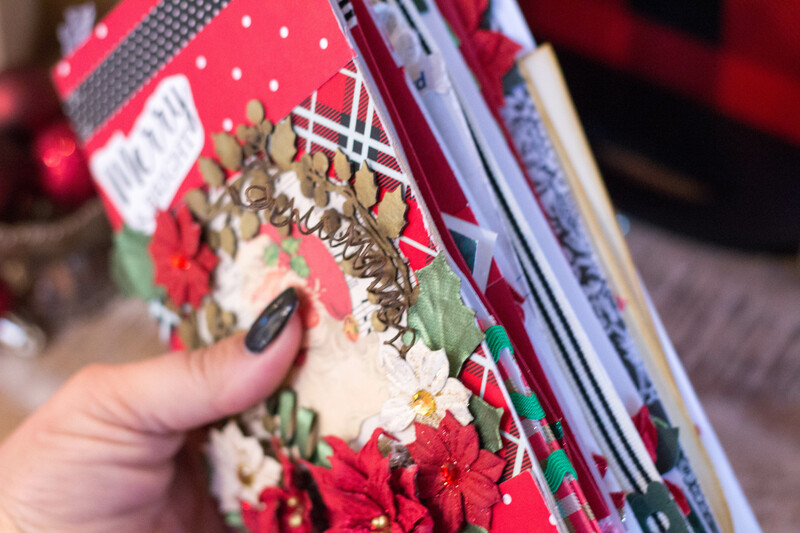 To assemble the Christmas journal, I cut one journal set using Eileen Hull’s Traveler Journal Die from mat board. Next, I trimmed some patterned music paper to fit both inside covers, and adhered with mixed media glue. Take a look at this cover! 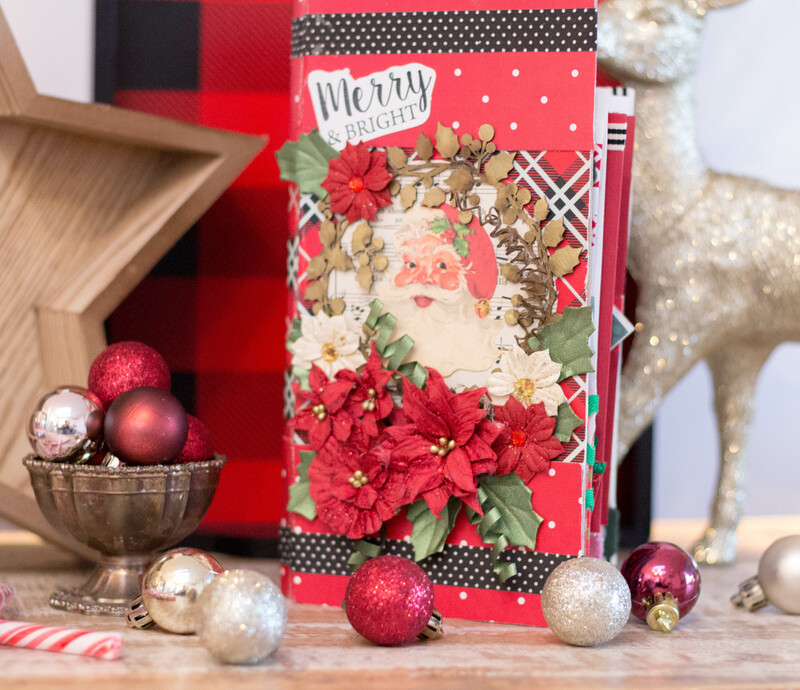 On my Christmas journal, I arranged a gorgeous paper crafting medley of poinsettias and holly leaves, along with a stunning gold tinted wreath. These flowers are from Little Birdie Crafts, where I’ve shared details about all the embellishments on the inner pages. 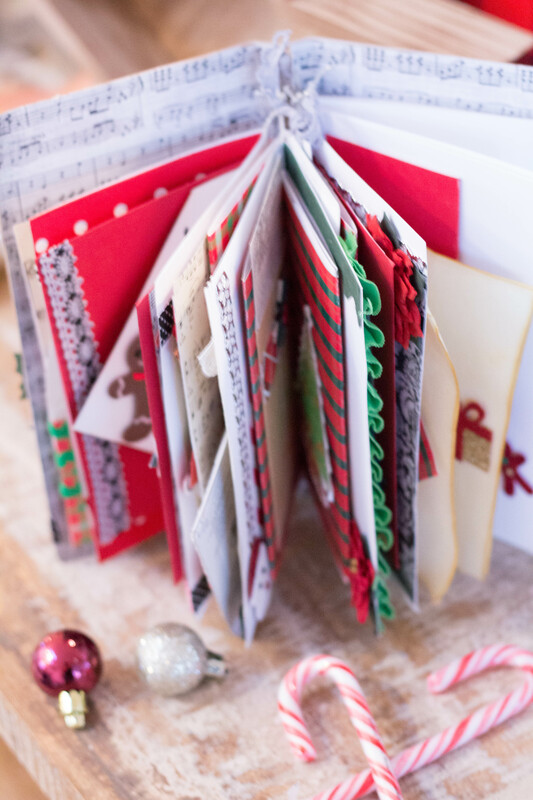 Within the journal pages, you’ll find tons of small pockets, envelopes and folded sections that can hold lists, money and gift cards. One year, I completely forgot to give a tip to my hairdresser; therefore, I made a list of service providers who I’d like to give a special gift to this year. 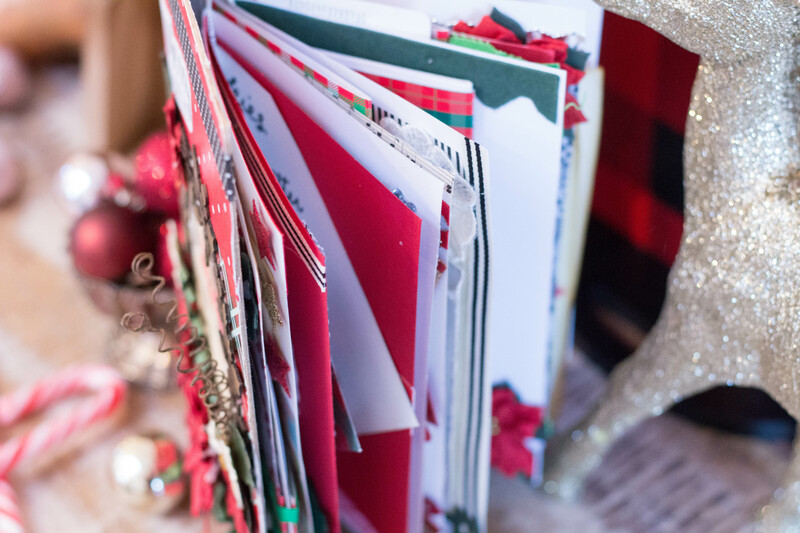 You can see that having a Christmas journal is a super practical idea, as well as a beautiful conversation piece. 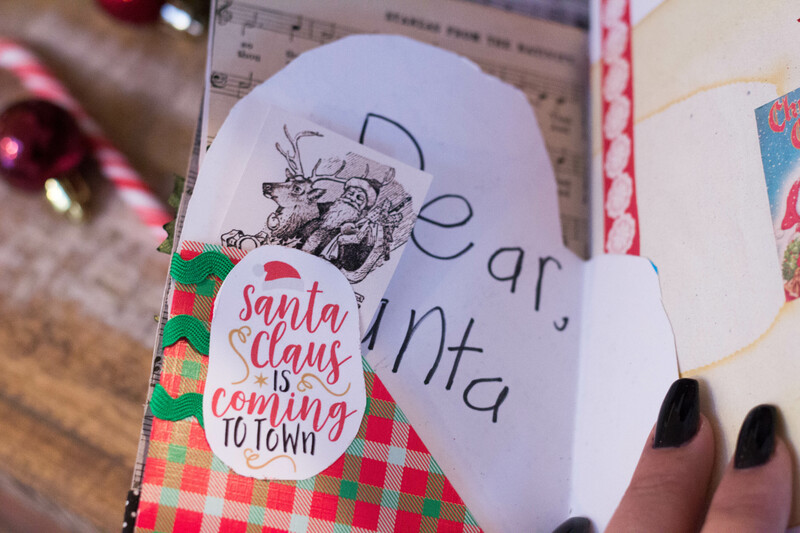 Inside my Christmas journal is a very special section where I’ve tucked away my young daughter’s letter to Santa. I love her writing, and it’s handy to have this available when I’m trying to remember what the hot new toys are this Christmas! If you’re like me, when the holidays roll around it’s probably a mad scramble to find things, like favorite recipes. One thing I can never seem to find when I need it is my awesome sugar cookie recipe. 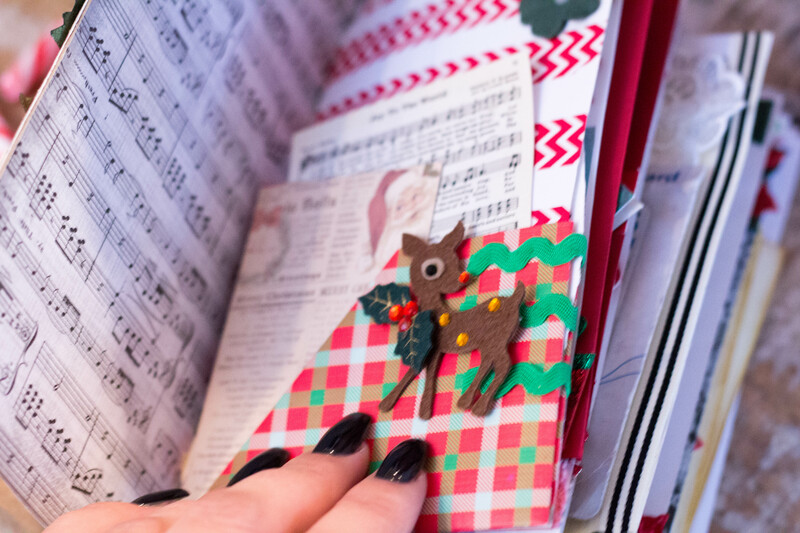 Hence, I popped it right inside my Christmas journal! Now, I can just flip to that section whenever I want to bake up something sweet for Christmas! When you’re creating a junk journal, it’s especially relevant to remember that there really are no rules! I added inserts made from all different kinds of papers, and embellished with scraps of ribbon, trim and stickers to my heart’s content. While I was making this project, I was so inspired, I found the pages were really stacking up! As a good friend told me, “If you can’t close your Christmas journal when you’re finished, then it’s a good one”. 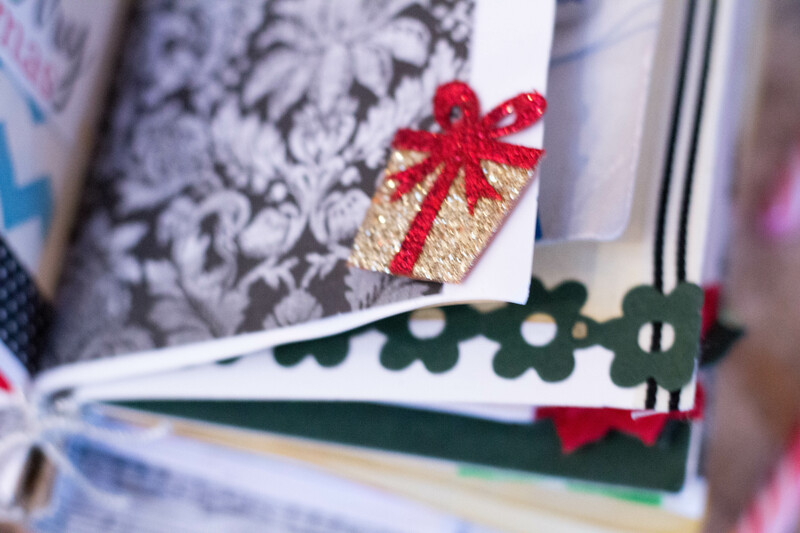 I love this suggestion, and hope you agree, this Christmas journal is a great one! Ho, Ho, Ho, Shopping I Go! 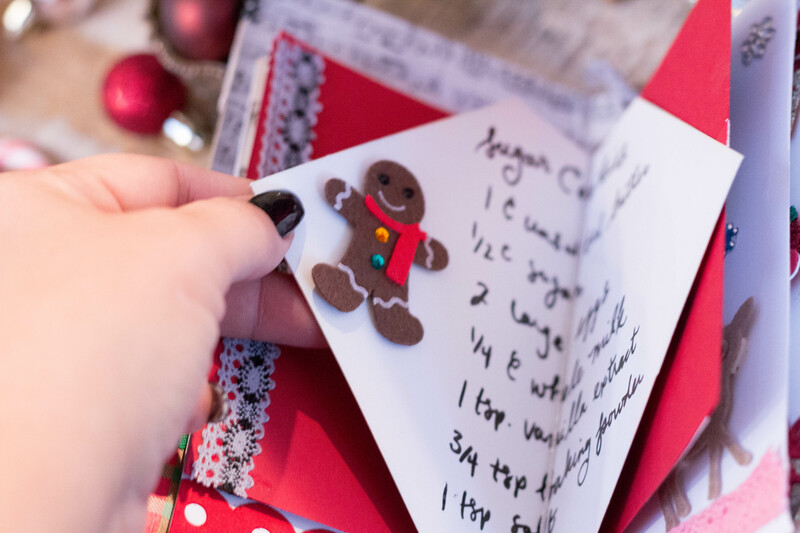 Thank you for reading along about how I put together this cheery Christmas Journal! Hopefully I helped get you into the holiday spirit, and provided ideas for staying organized during the hustle and bustle this season! Love this journal? Check out another one HERE!